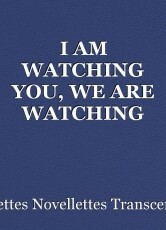 WE ARE ALWAYS WATCHING YOU!!!!!!!!!!! A little moment that will live always. This is just a little blurb of course about suicide, I have this thing where I hate the idea of a good life gone to waste because someone was offered the help they deserved or the right person was not there to give a helping hand. really I hate when people have nowhere to go. I know it is cliche' but I have been there to a really low point and I've been thinking about it alot recently. I want everyone to know that the right person is out there and the opportunity is out there if only you can grasp it. alot of times that means leaving your normal day to day routine and embracing the thing that you fear most. That moment is looking right at you it is watching you. Wow! I am speechless, Kossettes. This impressive... Very well done.